Hi folks, I apologise for the hiatus on the updates on this blog. Today I'll be sharing a kagerō fun deck that we can play in our locals. [AUTO](VC) Generation Break 1 (This ability is active if you have one or more face up G units in total on your (VC) or G zone): When this unit attacks a vanguard, your opponent may choose one of their rear-guards, retires it, if he or she does not, during that battle, this unit gets [Critical]+1 and "[AUTO](VC):At the beginning of your damage step, if the number of guardian is one, choose one of your opponent's guardians, retire it, and that unit's effects with "cannot be hit" is nullified.". [AUTO](VC):[Counter Blast (1) and Soul Blast (1)] When this unit is placed on (VC), you may pay the cost. If you do, choose one of your opponent's grade 1 or less rear-guards, and retire it. This card simply negates sentinels and damage nullifier. The turn you rode this card, is enough to clear 2 of your opponent rearguards. Combo it with the notorious Dauntless Drive Dragon would be devastating. Firstly, it allows 3 rearguards to be retired and if your opponent do not have any rearguard to retire, they would unable to place a negate on the guardian circle which gives them limited choices of guarding using grade 2s, 1s and zeros. Dauntless drive gives this card the massive power boost that it needs to apply pressure on the opponent. And a restanding vanguard would mean trouble for your opponent if they ran out of cards to retire and cards from their hand to guard. 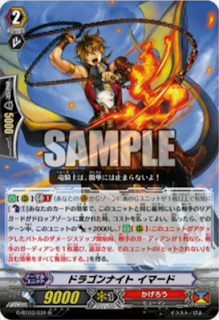 [AUTO](RC) Generation Break 1 (This ability is active if you have one or more face up G units in total on your (VC) or G zone):[Counter Blast (1)]: When an opponent's rear-guard in the same column as this unit is put in the drop zone due an effect from one of your cards, you may pay the cost. If you do, until end of turn, this unit gets [Power]+2000 and "[AUTO](RC):At the beginning of your damage step that this unit attacks, if the number of guardians is one, choose one of your opponent's guardians, retire it, and that unit's effects with "cannot be hit" is nullified.". 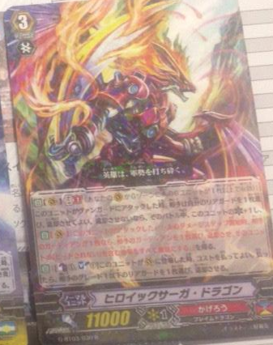 Similar to Heroic Saga Dragon, it had an effect that triggers the negation of nullifiers. Its condition is relatively easy to fulfil and kagero has loads of options of retiring rearguards such as twilight arrow dragon, berserk dragon, etc.. etc..
Ride Dauntless drive Dragon. Stride every turn if possible each turn or you can break ride dauntless over dauntless to pressure and to drain your opponent shields. Push them to 4 to 5 damage if possible. Finale Turn with Heroic Saga break ride on dauntless. Clear their rearguards with removal cards such as berserk dragon, twilight arrow dragon. Swing for the win with a restanding Vanguard. The deck is pretty linear with its strategy, straightfoward and simple to use for beginners. Not to forget it is wallet friendly as well with the exception of the 4x dauntless drive dragons. Until next time. Heroic saga doesn't counter PGs, all anyone needs to do is just throw a PG and any other random card to counter saga's GB1 effect. This post is moot.